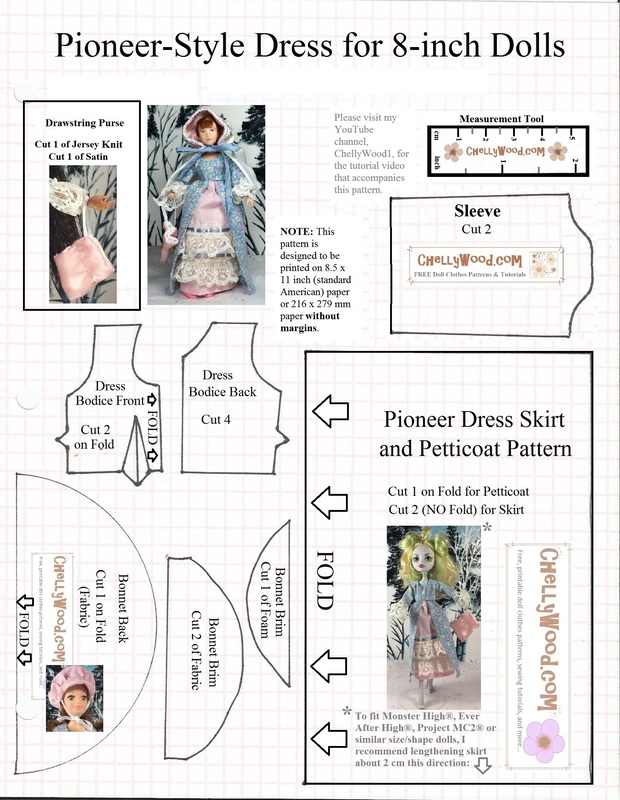 Visit ChellyWood.com for more free sewing patterns & tutorials for dolls of many shapes & sizes. Yes, I did post this pattern last week too, but you’ll need this pattern, in order to make the bonnet we’re sewing this week. The bonnet is designed for the tiny 4.5-inch (11 cm) heads belonging to 8″ dolls, so it’s not likely that it will fit Monster High or Ever After High dolls (although the dress actually does fit those two doll bodies, as we saw last week). Please note that this bonnet does fit my Momoko™ doll, as her head is significantly smaller than most 11-inch fashion dolls’ heads. Tomorrow I’ll post the tutorial showing you exactly how to make this bonnet, step-by-step. If you’re searching for a different pattern, please have a look at the Gallery Page. That’s the easiest way to search through all of my patterns to find what you want. Each image on the Gallery Page takes you to links for patterns and tutorials. Please note: you must enlarge my patterns to fit a full-sized piece of American computer paper (8.5 x 11 inches or 216 x 279 mm) without margins, before printing. My designs normally use a 1/4 inch seam with my patterns, but when working with 8″ dolls, I use a 1/8 inch seam because they’re tinier.